Comment: this is a subsequent virtual journey around the world regarding the imprint top-40`s audio-visual teleportative series Sounds and images from… . 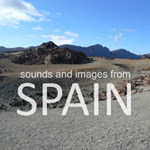 The recent issue of three parts is based on the recordings from Malaga, Dilar, San Jose, Tenerife, Lanzarote, and Fuerteventura. The field recordings are recorded by Vadim Ugryumov. In general, the issue does not surprise because the sounds represented over there do coincide virtually with other ones based on the same concept of necessity. For instance, there are up the snippets of street sounds (the sounds of bypassing motorcycles, for instance), the chirping of cicadas, speech snippets. In a word, the mechanical sounds are either set against or interwoven with the organic, natural ones. However, the most striking characteristic are recordings of the covers of some rock and roll classics. In a nutshell, given that it embraces a bunch of different, intriguing sounds the result is captivating.